This publication and the abstract below was published by U.S. Department of Energy on September 12, 2017. ICIT strongly encourages you to visit the U.S. Department of Energy Publication Library to search for additional information security resources which are freely available. 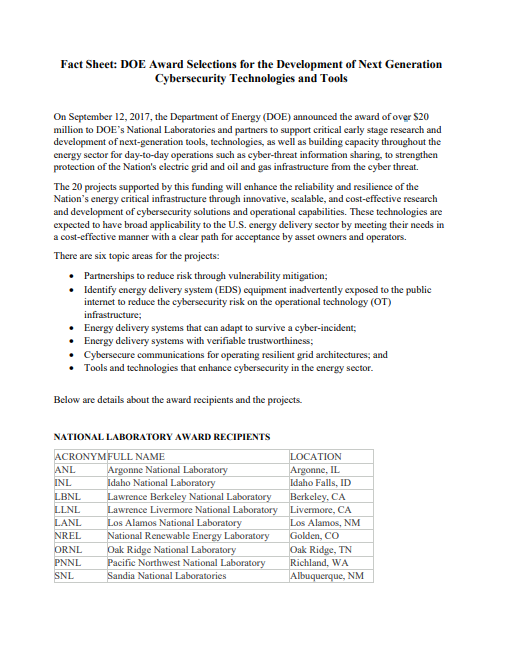 On September 12, 2017, the Department of Energy (DOE) announced the award of over $20 million to DOE’s National Laboratories and partners to support critical early stage research and development of next-generation tools, technologies, as well as building capacity throughout the energy sector for day-to-day operations such as cyber-threat information sharing, to strengthen protection of the Nation’s electric grid and oil and gas infrastructure from the cyber threat. The 20 projects supported by this funding will enhance the reliability and resilience of the Nation’s energy critical infrastructure through innovative, scalable, and cost-effective research and development of cybersecurity solutions and operational capabilities. These technologies are expected to have broad applicability to the U.S. energy delivery sector by meeting their needs in a cost-effective manner with a clear path for acceptance by asset owners and operators.